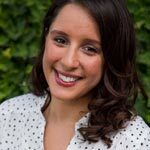 Alexandra Pitilli is currently an 8 Weeks to Wellness® nutrition coach and studying to be a licensed Nutritionist while getting her Masters in Human Clinical Nutrition from the Maryland University of Integrative Health. She is also receiving her Graduate Certificate in Nutritional Psychology hoping to blend the two fields in a future private practice. In her free time, she enjoys working out, yoga, cooking up creative dishes for her blog Sprouting Seeds Nutrition, and playing with her rescue dog, Ace. Connect with her on LinkedIn.